Washington (CNN) – The afternoon coffee run – it's a must for office workers worldwide, including, apparently, President Barack Obama. At around 2:30 p.m. ET on Monday, the commander-in-chief – with little warning to his aides, security detail or the press that follow him everywhere – burst the White House bubble and walked a block to the nearest Starbucks. 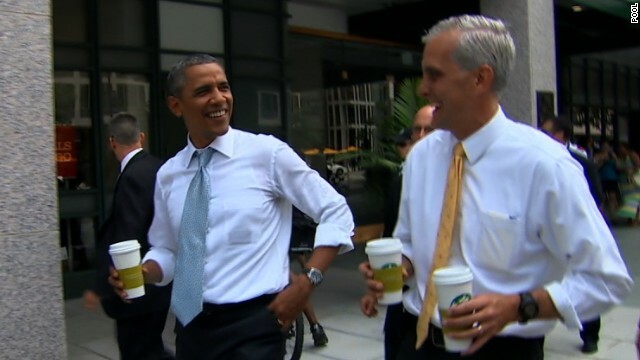 Joined by his chief of staff Denis McDonough (and accompanied by Secret Service agents), Obama told reporters he'd ordered "just a tea." Paper cups in hand, the pair moseyed back down the street, waving at tourists, chatting to construction workers, and generally enjoying Washington's late-spring sunshine. While still rare, Obama has begun enjoying more spontaneous departures from the tightly-controlled security of the White House. Last month he surprised tourists near the Executive Mansion during a stroll to the Interior Department a few blocks away. In May the President also made a stop at a Washington location of the burger joint Shake Shack and even made a surprise visit to a little league practice. Obama's even developed a catchphrase for his last-minute outings - as he said during his stroll to the Interior building, and repeated again on Monday, "The bear is loose." Did he pimpslap any hipsters while he was there? Maybe the one with the typewriter? Stay safe Mr. President! Everyone needs to escape every now and then. Yeah, yeah we know. He's not a bear, he's a Care Bear. How about an Obamacare Bear?? I'm sure SOMEBODY will criticize him for this. Good for him ...... and us. knowing Obama... he screwed up the order. OMG – Did anyone tell Chairman ISSA or the RepubliCons..!?? Surely this means IMPEACHMENT Hearings to start asap! The NYStock Exchange is fixing to hit 17,000. Obama is destroying this Country. I guess when Obama going to get some tea makes the ticker nothing bad has happend so far today. @ it must be said: so, you know the president, and feel qualified to speak on his behalf? Yet another example of your wishful thinking, but, I'm sure you're waiting with trembling lips and hips for Cruz or some other right wing gauleiter to pretend like he's like the rest of us while going off to the range to shoot cutouts of six-year olds with only FOX in attendance. The first act of a socialist dictator is to go to Starbucks. My momma taught me that if I didn't have something nice to say.........."
"...then you're probably a republican"? This is top political news why?????? The GOP LOSERS in congress won't even show their faces in public except on Sunday talk shows to spew their bs PROPAGANDA . If they showed their faces on the street , they would probably GET THE CRAP BEAT OUT OF THEM!!!!!! I Bet that was a buzz kill heading for the exit door ? OMG!!! The President has done it now! How dare he compromise the country's security by... by... by.... going to get coffee!!! What, Tea! Why that good for nothing Socialist, Marxist, Lennonist, Starrist, Harrisonist, McCartneyist!!! He has ruined our country for the 17th time! Now he has sullied the name of us Tea Baggers by his drinking of tea. Impeach him. He cannot get away this!!! Why do Republicans hate Barista's ? The GOP spends more money on Coffee Crystals , Coffee mate and Sweet'N Lo then any other party. WHAT IS A NON DARY CREAMER DOING AT THE TEA PARTY ? Sonny, Sonny, Sonny..... The Dow Index is about to hit 17,000....not the NYSE. Have a clue when you throw things out there. Reading your posts suggests you don't have one.